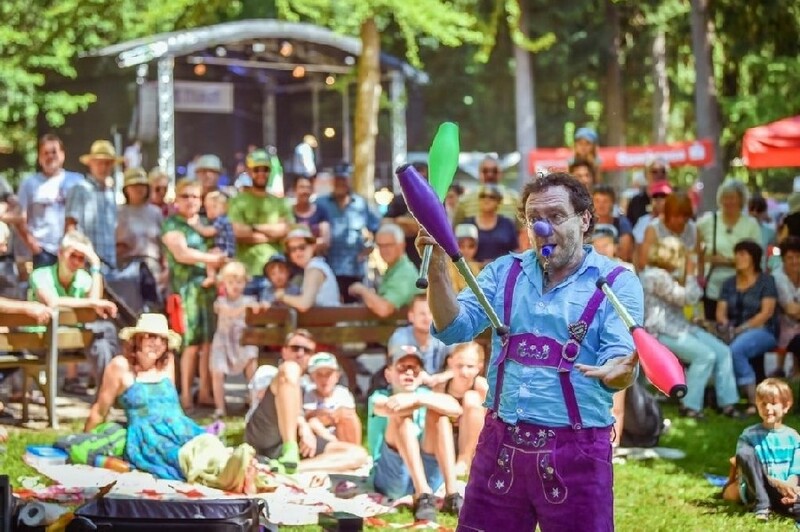 Clown and juggler Tom Bolton is an American entertainer and performer living in Stuttgart, Germany. He has worked as a professional entertainer since the early 1980’s. 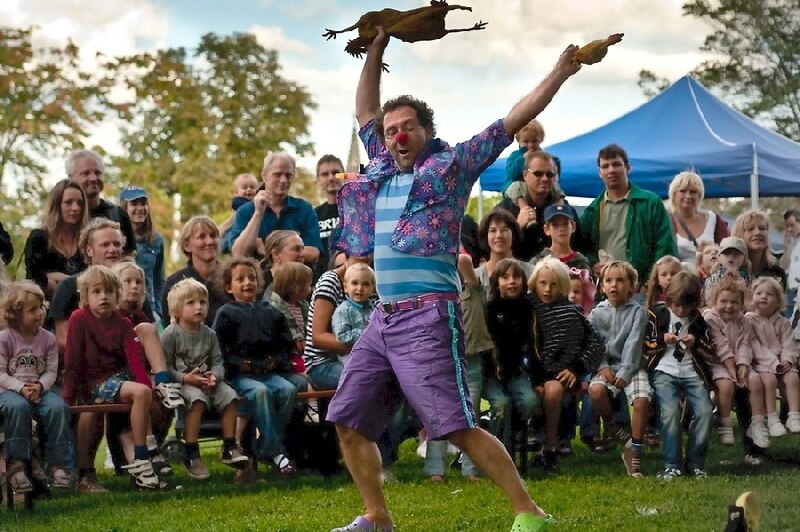 His unique style of mixing technical skills like juggling and unicycling with fast paced improvisation and gags brings laughter to children and adults alike. Tom’s respectful but provocative humor has made him fans world-wide. Tom specializes in family friendly entertainment that fits to every age, culture and nationality. His sympathetic style of interacting with his audiences bring people back to see him again and again. Entertainer Tom creates real laughter without just hyping his crowd or using flashy costumes. 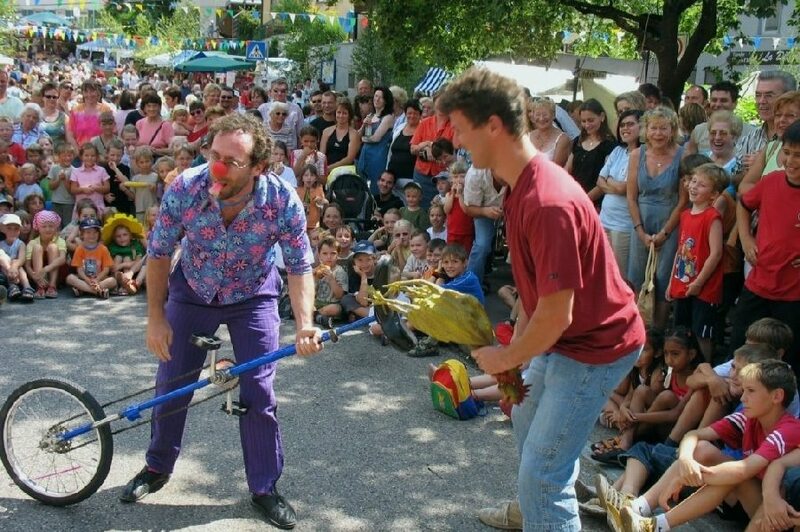 Whether at festivals or business events, openings or trade-fairs, weddings or private parties; Clown Tom Bolton is the highlight for nearly every occasion. His satisfied customers include such companies as Adidas, Airbus, Allianz, Audi, Bosch, HP, Mercedes, Porsche, Siemens, Sony, Toyota, Vodafone, Würth and many many more. Tom Bolton, professional entertainer available world-wide for your next event. With shows, performing artist Tom can entertain hundreds of people at one time. His silent performances can be done with or without a stage, indoors or outdoors, needing no special lighting or technicians. He brings all of his own equipment and can change location for each show if necessary. Without language barriers, entertainer Tom Bolton’s show can be presented world-wide be it Europe, America, Dubai or Singapore. In addition, Tom offers walk-around aka strolling entertainment. With small props and many unique jokes and funny observations he entertains individuals or small groups. For example, as a clown-security-guard he can greet arriving guests or latter as a clown-waiter he can entertain between the tables. Walk-around is combinable with shows or as an alternative for places where there is limited space. Other possibilities are balloon-twisting and juggling workshops. – specialty creations; Rudolph w/red nose, heart w/kissing doves etc. He’s traveled and performed in over 50 countries on 5 continents. He works mainly in Europe but is available world-wide for festivals and events. Tom offers top quality entertainment that is tailer fit and appropriate for all types of audiences. Like one sees in the photo gallery and video, Tom is the perfect strolling entertainer for festivals and outdoor events. This is where Tom’s mobility and flexibility comes into play. With his battery powered sound system he is independent from a stage or electrical outlet. Yet he can is still able to make shows for audiences of over 300 people at a time. Thus he can perform shows at different locations at an event or just do walk-around entertainment. A birthday is always a positive moment where more than just eating and drinking is appropriate. A good host will consider providing their guests with quality entertainment. The right performer will add fun and become the highlight of your event. 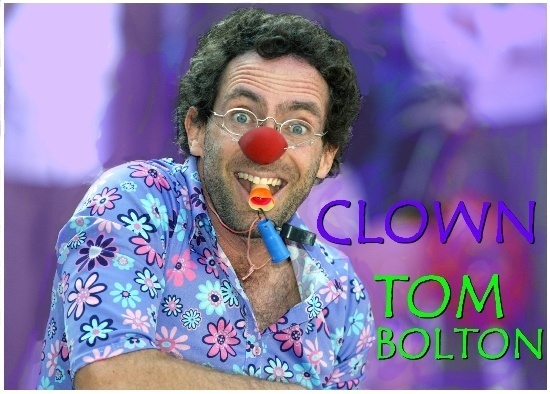 Clown Tom Bolton can already set the atmosphere by greeting the guests as they arrive and later circulate between the tables or wherever the people congregate. The icing on the cake so to speak will be his comedy clown show including juggling, unicycling, improvisation and spontaneous gags. He will interact with this audience so they feel they are part of the show. The physical space at indoor events is always critical. Tom has enough tricks in his repertoire that he can always manage to find the fitting solution. If a ceiling is too low for some of the juggling tricks it is best to know beforehand. Sometimes some tricks might need to be left out but Tom always has routines enough. Just make sure you describe your party location so he knows which equipment he should bring. Read more about Tom’s birthday party entertainment. Wedding entertainment is a special challenge for performers. One the one hand everyone is there to enjoy themselves. That is the easy part. On the other hand, a performer needs to appeal to very mixed audiences. And only top quality entertainment is good enough for such a special day. This means hiring an experienced, thoughtful artist who will make the utmost effort to make your celebration unforgettable. Tom Bolton is such a performer. He appeals to every age and culture. His entertainment can be made to fit from the fanciest to the most laid-back wedding atmosphere. Tom’s show can be the highlight of your event. He can also greet guests, do situation comedy between the tables or concentrate on keeping the kids busy with juggling workshops and/or balloon-twisting. Visit Tom’s wedding entertainment page to see more about what Tom’s has to offer. A number of factors are important so that your event goes well. If ones pays good money for entertainment then they should get full value. Whether a venue is appropriate for Tom’s show depends on space. As he does things like juggling on a unicycle, the height of any ceilings is critical. While there are many tricks he can always do, if the space is limited then he will have to leave some out. 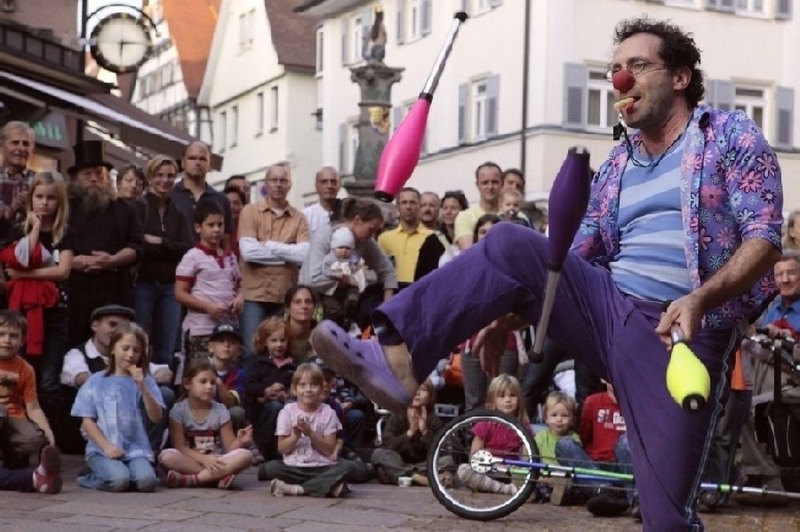 The finale number of juggling rubber chickens on the tall unicycle takes the most height. At many events Tom has done the show at one place but the finale outside or in a close by space with more room. And while Tom doesn’t need any spots or special lighting, the general lighting should be adequate so that people can see what he is doing. Sounds obvious but in many places they like to set a romantic atmosphere. Candle light is not suitable to see Tom’s show. Performers also have to eat. Tom might be at an event for a couple of hours and just a glass of water might be all he needs. But there is often a lot of travel and preparation time before and after a gig. This may mean that he has gone half a day without getting a proper meal. To support that he can do as good of a performance as possible it is advisable to clarify his needs. Tom eats dairy, fish and eggs but no meat. This means that a sausage or hamburger is not going to be adequate. Clown Tom does not paint his face and usually needs just a few minutes to get into his costumes. But it is best if there is a convenient place to do so. It does not have to be a fancy dressing room nor even have a mirror although it is recommended. He also needs to store his street cloths and valuables while he performs. Thus it is best if there is some place that can be secured. A shared dressing space with others is OK but somewhere to lock up his wallet and mobile phone is appreciated. Tom no longer has his own car. If needed he uses a car sharing system but more often takes public transportation. This can be difficult when he travels with a lot of equipment. If local connections are not good, it is often a great help to have him picked up from a train station rather than go looking for a taxi. If he does drive; then one should have a place nearby to park the car. If he has to drive around searching for parking and then drag his equipment a kilometer or two to get where he needs to perform then it is inefficient. If there is not parking option right by his performing space, it should at least be arranged that he can unload his equipment and re-park somewhere convenient.